Little is known of the early years of Art Blakey’s life. He was born on 11 October 1919 in Pittsburgh, Pennsylvania into a poor, very pious family. Legend has it that for a while he worked in a mine and in a steel works; only at around the age of twenty did he devote himself entirely to music. He started off as a pianist in a local big band that took inspiration from Count Basie, but early in the 1940s he turned to drums, accompanying pianist Mary Lou Williams, and then played in Fletcher Henderson’s band from 1943 to 1944. He was spotted by Billy Eckstine, who hired him to play in his modernist big band where the list of musicians read like a who’s who of young boppers: Dizzy Gillespie, Oscar Pettiford, Fats Navarro, Sonny Stitt and Miles Davis. Blakey remained with them until the group disbanded in 1947. Like so many black Americans of the time in search of their African roots, he converted to Islam and took the name Abdullah Ibn Buhaina. He headed a co-operative big band, the 17 Messengers, and, drawn to the new directions jazz was taking, collaborated with musicians like Sonny Rollins, Bud Powell, Miles Davis as well as Thelonious Monk. He played in the pianist’s first recordings for Blue Note in 1947, and by the turn of the next decade was one of the new jazz scene’s most prominent drummers, along with Kenny Clarke and Max Roach. He played and recorded frequently with musicians including Fats Navarro, Dexter Gordon, Sonny Stitt, Miles Davis, Charlie Parker, Dizzy Gillespie, Lucky Millinder and Buddy DeFranco. Blakey began a very productive partnership with pianist Horace Silver and in his company he co-directed a series of bands, including a quintet with Clifford Brown on trumpet, Lou Donaldson on alto saxophone and Curly Russell on bass. Their 1954 live recording A Night at Birdland for Blue Note was a hit, and was established as the aesthetic manifesto of a new trend: hard bop. Striving to synthesize their stylistic innovations in the form of bebop with the cornerstones of black music, gospel and the blues, Silver and Blakey founded a new quintet in 1955 with Hank Mobley and Kenny Dorham. This was the original Jazz Messengers. The following year Silver moved on, leaving Blakey on his own at the helm. For a while he continued to play as a sideman to musicians including Herbie Nichols, Donald Byrd, Cannonball Adderley, Gigi Grice, Jimmy Smith, Kenny Burrell, Grant Green and Lee Morgan, but from the outset the drummer was the driving force behind the Jazz Messengers: his rhythmic genius, his passion, his instinct and his organizational skills made the group – over some thirty-five years of existence – into one of the most influential in the history of jazz. Through the Messengers, Blakey shared his tastes and penchants. Moreover, the group served as an incubator for exceptional young talents from which emerged, over the years, musicians as significant as Johnny Griffin (1957) Lee Morgan (1958-1961), Wayne Shorter (1959-1964), Freddie Hubbard (1961-1965), Woody Shaw (1969-1973) Wynton Marsalis (1980-1982) and Terence Blanchard (1982-1986). Depending on the formations, the periods and the artistic sensibilities of the various musicians who were successively in charge of musical direction, the Jazz Messengers sometimes ventured into new musical territories that reflected the zeitgeist but never broke from the archetypal forms of hard bop. And thanks to Blakey at his drums, gifted with an inimitable sense of tempo, accentuation and skill in getting the themes back on track, continuity of both style and spirit were guaranteed. 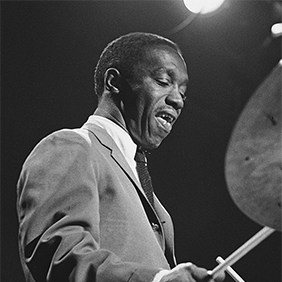 Art Blakey tirelessly kept the flame burning as he led his band into the late 1980s, and even occasionally played as sideman in recording sessions, such as the Magical Trio with James Williams, and tribute concerts that brought together the glorious names of jazz history, such as Jackie McLean, Freddie Hubbard and Johnny Griffin. Blakey died of lung cancer in New York, at St Vincent’s Hospital and Medical Center, on 16 October 1990.